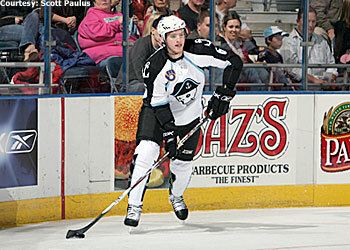 Cody Franson has helped steer the Milwaukee Admirals offense to the tune of 11 goals and 22 assists this season. Cody Franson always admired the flotilla of houseboats that invade the lakes in his hometown of Sicamous, British Columbia, during the summer. They are magnificent extravagances, custom fitted with marble top kitchens, hardwood floors, big screen televisions, fire places and even water slides. Franson spent a few summers working as a porter, serving the guests and helping tote the suitcases from the dock to the boats. You want an agility test? Try carrying a couple weeks worth of luggage down a narrow ramp without spilling any into the water. "You try not to do too much, you'll be all right," Franson said. "It was a good first job. It wasn't easy work, but it was fun work. You are in the sun all day, you meet people." Franson is now a rookie defenseman for the Milwaukee Admirals, and it looks like his ship is about to come in. He could soon be in a position to afford one of those houseboats himself, and have an eager teen work for him. But here's the thing about Franson. Houseboats are for floating. He likes to move, really move. He'll take a jet ski, or maybe a speed boat, and be on his way. "They don't go very fast," he lamented about houseboats. "Houseboats, it takes you longer to get places. I like just being able to go where I want." Such as, undoubtedly, the NHL. Or at least to more stardom in the AHL, where Franson, 20, is quickly moving up the ranks from deck hand to Admiral. At 6-foot-4, Franson is about as hard to overlook as those nautical palaces. And he uses that tall perch, a wicked snap shot and tape-to-tape passing radar to help steer the Admirals offense, to the tune of 11 goals and 22 assists. Rookie defensemen who log as many minutes as Franson can potentially sink their team's playoff hopes. But Franson has helped the Admirals to a solid fourth-place slot in the revved-up West Division and he anchors one of the better defenses in the AHL. "He's able to play at a very mature level," Milwaukee coach Lane Lambert said. "We've been seeing a steady progression from him all year long. Put it this way, really, he's been a good quality, character kid. He's very receptive to coaching." The most impressive attribute of Franson, a third-round pick by Nashville in 2005, might be something that's not immediately apparent. He's a winner, and he expects that to be more habit than quirk. He was a huge brick for the Vancouver Giants team that won the Memorial Cup last year, and that reached that championship round two seasons ago. He also played on Canada's World Junior gold medal team last year, earning all-tournament honors. "As we go down the stretch here, part of his progression is to bring those (winning) intangibles to the pro level," Lambert said. "The nice thing about him is that with all the success he's had in his career, there is a long way to go. He's hungry. His attitude is really what's been his driving force for me." For a brief spell this season, Franson's attitude was driving him to distraction. When Lambert speaks of the rookie's development, he couches it in terms of working through a learning curve. Translating that from coach-speak, that means Franson began the season with eyes bigger than his pro talent at the time. He tried for the home run pass, often forcing a play when none was there. "With juniors, you are dealing with younger guys. You tend to get away with things like that," Franson said. "Up here, those passes will get picked off. They come right back in your face. It's a matter of just staying patient with it. I'm my worst critic. If I'm not doing well, I'm hard on myself. You have to push yourself to do better all the time." And learn how to push back at opponents. With the Giants, Franson was rightfully earmarked as an offensive defenseman. He generated 55 points two seasons ago and 51 points last year. Against players his own age, he could just kind of run into and over opponents. No more. Taking the body now means applying every drop of his considerable G-force towards burying opposing forwards. "It's something I've had a hard time adjusting to," Franson said. "I've always been offensive-minded. It's a mental transformation I've had to go through, always try to finish your checks. It wears on your body a bit. You are trying to be a force on the ice." That highlights the importance of what Franson said is his largest off-ice transition to the pro game – learning how to put his engine in idle. "Coming in this year, it's your second time being a rookie (along with juniors)," he said. "The big adjustment for me was the time away from the rink, having nothing to do when you get home. After a little bit, you get used to it. You start to find stuff to occupy yourself." If those efforts to unwind don't do the trick, at least Franson knows where to find the off-season smooth sailing. Lack of jet power aside, the tranquility of a houseboat probably seems a lot more enticing after a season of AHL body blows. "Oh, it's always appealing," Franson said. "Definitely right after the season a houseboat is a great idea to really relax." "That'd be great," he said. "Training might be an issue."